Today, this post will be a bit of a hodgepodge of things about my weekend like I used to write. I haven’t done this in a while. My weekend has been rather meandering, so this post will be too (smile). Well, they forecasted snow for most of the country today, but we just missed it. They showed some really pretty photos on the news earlier of the places that did get snow. So today we are snowless, but it’s cold. My other favorite from the show was the reuniting of Kajagoogoo who had the hit "Too Shy". This was a smooth song too. The opening fade in of this song is so smooth and the bass is just hot. Love it! I guess you can tell I love my 80s. (wink) I loved being a teen back then. The lead singer Limahl had interesting hair back then and he still has cool hair now(smile). The band hadn't played for over two decades together on TV here so it was great to see them all. Here's a clip of "Too Shy". Both Limahl and Tony Hadley look pretty much the same and they both still sound great. On Saturday, we went into town and I mailed my ballot for the Senatorial run-off in Georgia. When my county back home sent my main ballot, they also sent me one to use in case of a run-off. So I filled that out and got it mailed off. We also got some Christmas shopping done. A lot of the stores were having big sales so we jumped on that and got a few gifts. Later, we were sitting around watching TV and discussing where were we going to go around Christmastime. 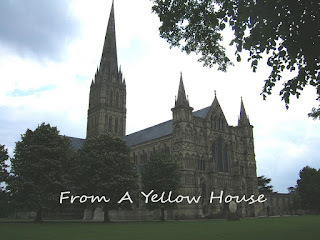 Last year, we went to Salisbury Cathedral for their Christmas Carol Service and that was wonderful. It really highlighted the Christmas spirit. The choir sang a cappella and their voices rang out around the sanctuary. It was a beautifully unique experience. This cathedral is just gorgeous. Here’s a photo. We are trying to see if they have anything at Bath Abbey, but so far we haven’t found that they do something similar, so we might end up going back to Salisbury. 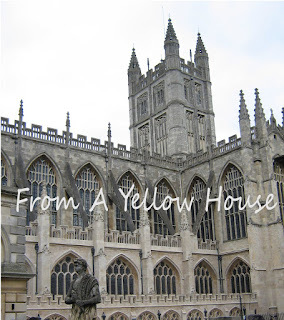 Bath Abbey and indeed the whole city of Bath are just absolute jewels. This city is one of the most beautiful places in the world to me and it's where Brit Boy went to university. Here’s a photo of the Abbey. Today, I am still in that old school music mood from Friday, so I have been playing some music from back in the day while I flip through my recipes for Thanksgiving. Gotta get those sweet potato pies done in the next day or so (smile) So I went down a musical memory lane and have been listening to The Jones Girls...I've always loved this song. My older sister used to play this song a lot. It’s been a good meandering weekend. Now onward to Thanksgiving…my FAVORITE Holiday! Trevor has decided that he is gonna camp out on the table all week so he won’t lose his place for dinner on Thursday. He loves his food. 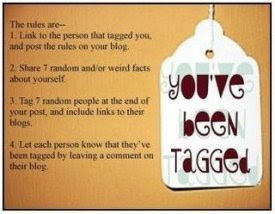 This is my second time being tagged so I had to dig a bit more in the drawer of my life to come up with seven more things. Here I go once more with my seven random things about myself. #2 – Back in March, I had a chance to talk to a researcher from the Oprah Winfrey Show about a feature that they were doing with some of us who were reading “A New Earth” along with the webcasts. The researcher asked me questions about my experience in reading the book. Then she told me that they would get back to me if they wanted to use me. Well, they never called back, but my “almost but not quite cheerleader” within me was thrilled. LOL. I was just grateful to be considered. #3 – I’ve met a few celebrities in my life. In the mid 80s, I met Dionne Warwick and got her autograph. She had a perfume out at the time and she was at a department store signing autographs. It was my mom’s birthday, so I thought this would be a good gift for her. So I spoke to Ms. Warwick and then she signed the box of perfume for my mom. Also, I have met two members of the group Hootie & the Blowfish back in 2000. I met the lead singer Darius and the guitarist Mark. They were cool. I met them after a concert that I attended with two of my nieces. I have nieces and nephews who are not that much younger than me, so we would hang out occasionally. And going a bit further back to 1995, I actually spoke to Darius on the phone when he was at a radio station in Atlanta. So it was a full circle moment when I finally got a chance to meet him face to face (smile) I was a big fan back in those good old days. #4 – I honeymooned on the island of Lanzarote, which is a part of the Canary Islands, with Brit Boy. The landscape is really unusual and scenes from “The Planet of the Apes” were filmed there. When I found this out I was excited. I loved all of those movies and the tv show. Here’s a photo of some of the landscape. #5 – While we were in Lanzarote, I took a ride in a submarine….well a mini one and Brit Boy was there too. (smile) It was a weird sensation. 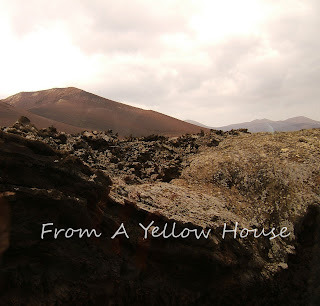 #6 – Also when we were in Lanzarote, we took a camel ride. I couldn’t believe how far it was to the ground. LOL. Brit Boy and I shared a ride. We traveled in a group and there was a camel attached to ours from the front and there was one attached to us from the back. We were riding along and all of a sudden I felt something rub my arm. I looked back and it was the camel behind us. They had a covering over his mouth so he couldn’t bite me, but he was intrigued by my arm and just kept rubbing his mouth and face on me the whole time. I guess he liked my scent. LOL. He was a cutie. #7 – I used to be something of a spelling bee champ when I was a kid in the 70s. I even have a second place ribbon squirreled away in my keepsakes. I have second place because I guess I had an aversion to being number 1 back then. LOL. I used to act as if I were a boxer and I would “take a dive” and mess up on purpose. It was a kid thing. LOL. Sometimes I would win and sometimes I would let myself lose. It was just a game I played. Here’s the thing though, now it seems sometimes that my spelling is slipping a bit and I have to double-check myself. I usually just laugh and say to myself, “well ain’t karma a b*tch”…LOL. Hey, for all of you royal watchers out there, here's some news if you don't already know. Today is Prince Charles' 60th birthday. Woo Hoo! (smile) And in ode to his big birthday, here's a cute video that someone made of the Prince of Wales getting down back in the day!!!! Enjoy and happy birthday your Highness! Several days ago, I was tagged by Bas at Istanbul Expat. This tagging has to do with books, which I LOVE!!! (smile) Love my books! Anyway, when he tagged me, I wasn’t reading anything which is kinda rare for me. I usually am reading something. Of course with me that can mean something that I have been reading for months because I have this habit of reading more than one book at a time and the reading gets strung out. I will have about two or three books going at once and then I’ll hop from one to the other and then revisit the previous one and I’m still able to pick up where I left off. I’ve always done this even when I was a kid. It may sound like my mind would be frazzled by this, but it works for me. Can’t explain it, but to each his own, right? It’s sort of one of those march to your own tune things and my tune comes in stereo. (smile) I have heard of other people doing this, so after that I was like, okay, so I’m not alone. LOL. Gotta love it! Do any of you do this? Anyway, he tagged me during a rare dry spot. I was taking a breather. The rules state that you pick up the nearest book for this tag, but for once there wasn’t a pile near my bed, because I had cleared the decks. So I put this tag on the back burner for a while. Well, in the last few days I have started to re-read a favorite book of mine, “A New Earth” by Eckhart Tolle because the time felt right. And I decided to take a chill pill and read just one book...a novelty ain't it? (wink) Then this morning, I looked at a note I had placed on the side table, right here next to the couch, it said, “Don’t forget the tag from Bas!” I said to myself, “Oh yeah, can’t forget,” and then I put the note back down. I turned to walk into the kitchen and kicked over a pile of books I had sitting on the floor next to the couch…my new “to read” pile. “A New Earth” singled itself out, so I took it as a sign. As for the quote, I haven’t come to this point during my re-read yet, but I remember it standing out to me before. It reminded me of the importance of simply sharing the spotlight with others. And it reminds me so much of my friend Kim that I lost recently. She personified this. Fear robs us of so much in life and keeping everything all for ourselves does cut us off from the whole. You can call it the whole of humanity in a spiritual sense or the whole person that you and I are meant to be. It doesn’t cost me anything to help someone or cheer them on along their path, but it costs me dearly to not do it. It diminishes us I think. This book has so much more to it and it challenges me and I like that. I imagine that I will refer to it time and time again during my life. I love it when a book stays with you like that. As for passing this one on, I will just open it up to you my dear readers. Please feel free to take this tag if you would like to participate. Have fun! Today, I would like to finally acknowledge some great awards that I have received over the past couple of weeks. 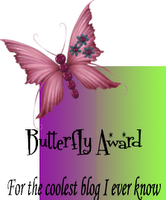 I’m a bit behind lately, so please forgive me my blogging pals who gave me these awards. 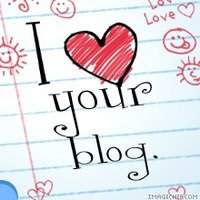 I received the “I Love Your Blog” award from Tahtimbo at Everyday Living . I’ve received this award before, but it never can get old to me. The greatest compliment is to do something that you enjoy and have other people really like it. So I’m thrilled. 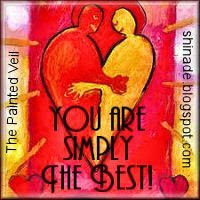 :-) Tahtimbo is a stay at home dad who writes a great slice of life blog. He also shares my interest in shows about ghosts :-) Please check him out. The rules are that you link back to the person that gave you the award and then pass it along to seven of your favorite blogs. Also let them know that they have received the award. The rules for this one are to link back to the person who gave it to you and then pick seven of your favorite blogs and let them know. I just wanted to say thank you to all of my readers/friends who have come by to give their support to me as I wrote about my friend Kim. All of the kind words were so comforting. This is what I love about the blogosphere...great friends and lots of true support. (smile) I'm so grateful.